This past weekend, I was struggling. I felt very raw and exposed. For two days I walked around and flinched at everything that moved in my direction. Jumpy and moody, everything seemed like an offensive against me, everything felt less than I deserved. I don’t know why this happens, this mood, but I know I don’t like it. On Saturday, I tackled a barbecue chicken project that had only middling results for the effort. (Surprisingly, it was a Smitten Kitchen recipe, and Deb’s stuff almost always goes perfectly. Though in fairness, it tasted better the next day, cold, when my disappointment had grown cold too.) Itchy, lonely, I went into Sunday feeling, I don’t know, like lately I’ve been trying far too hard for only mediocre results, on far too many things. Like my life has been that damned chicken. Stupid kitchen metaphors! Get the hell out of here! Long before the Saturday of disappointment, I had decided, after seeing these pictures, to try my hand at homemade english muffins on Sunday. Because I LOVE english muffins. And I love making complicated, beloved breakfast carbs at least once to see how it’s done. And then never making them again because really? 48 hours to make a croissant? When I can crawl here on my hands and knees and get an almond croissant any time I please? (Some things are better homemade, yes. Granola, for instance. But bagels? No. I’ll just go here, thanks everyone, good night!) I continue to embark on these insane, DIY projects because I feel like having an appreciation for complicated baked goods is never, ever a bad thing. But still… effort has not been my friend lately. I went into english muffin day with trepidation. I followed the instructions to the letter. I moved slowly and quietly through the process and still, doubt nagged at me. There should be a damn warning label on packets of yeast. Warning: yeast and doubt go hand in hand. To the cast-iron skillet I moved and I dropped the balls of dough on the barely hot skillet, watching for the heat-rise, feeling the doubt in me grow and with the doubt, the nastiness that comes along for the ride. The one that says I’m pathetic for trying. Anyone who has ever attempted something complicated and new in is familiar with this voice. It sounds like you but it is not you, it’s worse than the worst of you. Still doubting, I dropped the slightly risen dough balls into the (hotter) sister skillet (band name) and then, a few minutes later, felt my heart skip a beat as the muffins began to crisp and brown. As promised. As promised. The joy of having something you make match the pictures is… it’s deep. It’s good. 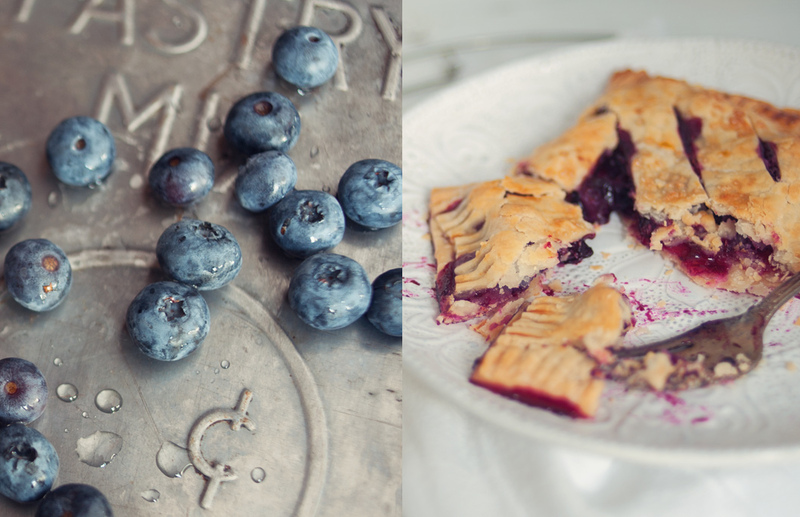 What does this have to do with blueberry hand pies? Pie dough scares people. Pie scares people (not the people who eat it, or at least I am unaware of this horrible phobia, if it exists). But you can do it. You can. Even in summer. Even when instructions like “do not let butter get warm, ever” are looming over you. Just move slowly and quietly. Read it through. Prepare. Follow the instructions. Take a deep breath. Even when you’re feeling jittery and lost, your hands and the page can guide you back. Trust me. They can guide you back. Stop thinking so much. Shush the doubt in your head. Let go of the rest. After all, that’s partly why you’re in the kitchen. Isn’t it? And when the finished product could taste this good, you have to try, people. At least once. 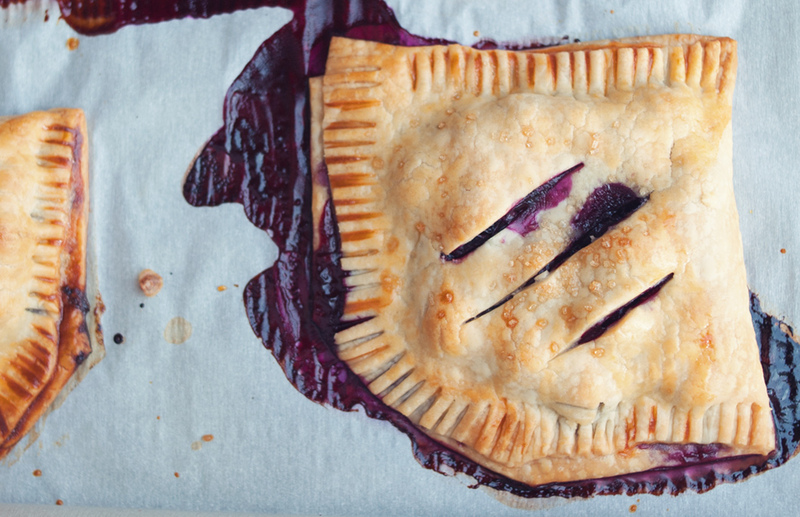 DO AHEAD: Pie crust can be made and chilled 3 days ahead. Remove from fridge and let stand for 15 minutes before rolling out commences. 1. In food processor, pulse flour, sugar, and salt. 2. Add butter; pulse until the texture of very coarse meal. 3. Add 1/4 cup ice water; pulse, adding more water if dry, until dough comes together in clumps. 4. Form into a square, wrap in plastic, and chill until firm, about 2 hours. 5. Preheat oven to 375°F. Line a baking sheet with parchment paper. 6. 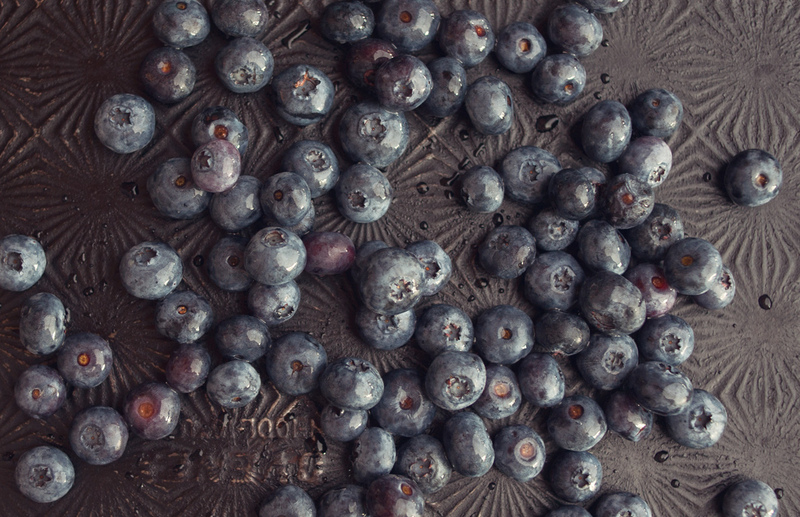 In a medium bowl, toss blueberries with lemon zest, lemon juice, sugar and salt. 7. On a floured surface, roll out pie crust dough to a 15 x 12 inch rectangle. Cut into 6 rectangles. 8. Brush edges of pie crust rectangles with water. Mound some blueberries in center of each. Fold dough over and press edges to seal. 9. Place pies on baking sheet, brush with egg wash and sprinkle with raw sugar. With sharp knife, cut slits in tops of pies. 11. Transfer to a wire rack. Serve warm or room temperature. These hand pies look delicious! I love the blueberry color. Love how simple and pleasant the hand pies look. Definitely going to try making them! What if i use blueberri jam instead? Hmmm, I think that would work! The filling would be thicker, I imagine. You can try folding fresh blueberries into the jam too, that might be good. Let us know how it turns out!